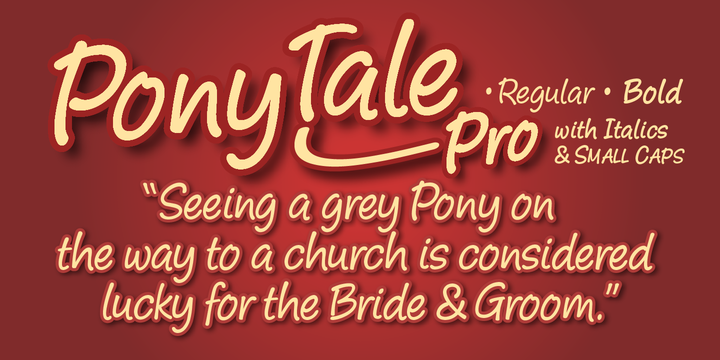 Pony Tale Pro is a geometric handwritten typeface created by John Nahmias and published by Jonahfonts that is available in 4 styles, 2 weights (Regular & Bold) and their italics. Ot contains Small Caps, Central European Diacritics and OpenType Swash Glyph endings. For more useful things access easily OpenType applications. It works great for display, headline, magazine, logo, editorial projects, packaging, poster etc. A font description published on Monday, August 3rd, 2015 in Fonts, John Nahmias, Jonahfonts by Alexandra that has 4,646 views.